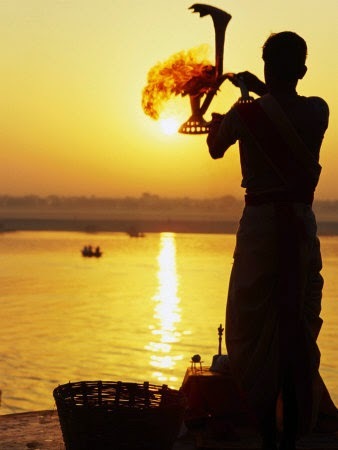 The first ten days of the month Jyeshth, known as Dashahara, are dedicated to honour the river Ganges, or Mother Ganges. The Ganges is believed to flow in the three worlds: in heaven it is called Mandakini, on earth the Ganges (or Ganga), and in the nether region the Bhagirathi. Thus the Ganga is known as “Tripathaga”, or the “Three Path River”. People believe that by bathing in the Ganga sins are washed away. The principle centres for the worship of the Ganga are Gangotri, the source of the river; Haridwar, where she comes down to the plains; Allahabad, where she joins the Yamuna; Varanasi, the holy city; and Sagara Island in her estuary where she finally flows into the Bay of Bengal. 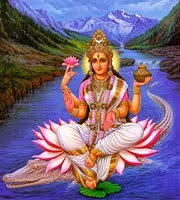 Ganga is supposed to be the daughter of the Himalayas and the goddess Mena. According to the Puranas, the heavenly Ganga flows from Vishnu’s toe. Ganga sometimes assumed a human form. In one such appearance, she married King Shantanu and was the mother of Bhishma, grandsire to the warring Pandava and Kaurava clans (see Mahabharata). Long ago there was a king named Sagar. Once he performed the horse sacrifice known as Ashvamedh. After much wandering one day the king’s horse reached the ashram of Kapil Muni. Then seven thousand of the king’s boys also reached there in search of the horse. They had wickedly imagined that Kapil Muni had deliberately kidnapped the horse, and they decided to destroy the muni. Kapil Muni got angry and cursed them. There upon they all were burnt and reduced to ashes. Anshuman tried but did not succeed in bringing down the Ganga on earth. Then his son Dilip also tried, but without success. Finally his son Bhagirath after performing terrible austerities managed to bring down the Ganga to this earth. Mother Ganga was pleased with Bhagirath, but asked him to obtain also the good pleasure of Shankar (Lord Shiva). Shankar agreed to take the burden of bringing the Ganga on earth. Thus on the tenth day of the bright half of Jyeshth, Mother Ganga began to flow from heaven to the matted hair of Shankar, and from the hair of Shankar she began to flow on this earth. In this way the children of Sagar were saved. For this reason the Ganges is also known as the Bhagirathi. END. If you are so fortunate as to be in a place in Bharat Bhumi where the sacred Ganges flows or one of the mystical magical places where She appears contrary to material science, such as Mana Sarovara, Manasi Ganga (Bhubaneshwar), Madhwa Sarova (Udupi), etc., then you will be able to go down to her waters and pay your obeisances, say your prayers and take that water upon your head. Then please say a prayer to invoke the blessings of the Lord upon all of us not so fortunate as to be there with you. For most of us reading this that will not physically be possible, although certainly through Manasa puja – meditation one may still perform that worship. Whether you are in Gangotri (the place where she manifests first in this realm) or if you are at (H)Rishikesha or Haridwar, Benares (Varanarsi), Allahabad (Prayag) or in Mayapur, West Bengal, or as I am here writing this remembering those wonderful places the purifying association of Mother Ganga remains the same. Scientists’ still cannot understand how unlike ordinary water, when you take a bottle of that and keep it for YEARS, it never becomes green and slimmy. It always remains in its pure condition. My memories of early morning (03:30am) dips at Haridwar (Vishnupadi) still leave me as near breathless as entering into her icey waters as we did in January (winter in the Norther Hemisphere) 1980. 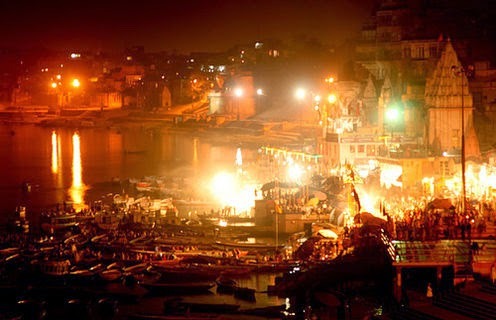 In the evening the floatila of thousands of leaf boats laden with flames, flowers, and sweetmeats, bobbing gently as they flow with the current to the resounding sounds of the bells and arati songs, and disappearing flickering into the distance. A sight worth seeing. by HDG Srila A.C. Bhaktivedanta Swami Prabhupad. The Seventeenth Chapter describes the origin of the Ganges River and how it flows in and around Ilavrita-varsha. There is also a description of the prayers Lord Siva offers to Lord Sankarshana, part of the quadruple expansions of the Supreme personality of Godhead. Lord Vishnu once approached Bali Maharaja while the King was performing a sacrifice. The Lord appeared before him as Trivikrama, or Vamana, and begged alms from the King in the form of three steps of land. With two steps, Lord Vamana covered all three planetary systems and pierced the covering of the universe with the toes of His left foot. A few drops of water from the Causal Ocean leaked through this hole and fell on the head of Lord Siva, where they remained for one thousand millenniums. These drops of water are the sacred Ganges River. It first flows onto the heavenly planets, which are located on the soles of Lord Vishnu’s feet. The Ganges River is known by many names, such as the Bhagirathi and the Jahnavi. It purifies Dhruvaloka and the planets of the seven sages because both Dhruva and the sages have no other desire than to serve the Lord’s lotus feet. The Ganges River, emanating from the lotus feet of the Lord, inundates the heavenly planets, especially the moon, and then flows through Brahmapuri atop Mount Meru. Here the river divides into four branches (known as Sita, Alakananda, Cakshu and Bhadra), which then flow down to the ocean of salt water. The branch known as Sita flows through Sekhara-parvata and Gandhamadana-parvata and then flows down to Bhadrasva-varsha, where it mixes with the ocean of salt water in the West. The Cakshu branch flows through Malyavan-giri and, after reaching Ketumala-varsha, mixes with the ocean of salt water in the West. The branch known as Bhadra flows onto Mount Meru, Mount Kumuda, and the Nila, Sveta and Sringavan mountains before it reaches Kuru-desa, where it flows into the ocean of salt water in the north. The Alakananda branch flows through Brahmalaya, crosses over many mountains, including Hemakuta and Himakuta, and then reaches Bharata-varsha, where it flows into the southern side of the ocean of salt water. Many other rivers and their branches flow through the nine varshas. The tract of land known as Bharata-varsha is the field of activities, and the other eight varshas are for persons who are meant to enjoy heavenly comfort. In each of these eight beautiful provinces, the celestial denizens enjoy various standards of material comfort and pleasure. A different incarnation of the Supreme Personality of Godhead distributes His mercy in each of the nine varshas of Jambudvipa. tatra bhagavatah sakshad yajna-lingasya vishnor vikramato vama-padangushtha-nakha-nirbhinnordhvanda-kataha-vivarenantah-pravishta ya bahya-jala-dhara tac-carana-pankajavanejanaruna-kinjalkoparanjitakhila-jagad-agha-malapahopasparsanamala sakshad bhagavat-padity anupalakshita-vaco ’bhidhiyamanati-mahata kalena yuga-sahasropalakshanena divo murdhany avatatara yat tad vishnu-padam ahuh. Sukadeva Gosvami said: My dear King, Lord Vishnu, the enjoyer of all sacrifices, appeared as Vamanadeva in the sacrificial arena of Bali Maharaja. Then He extended His left foot to the end of the universe and pierced a hole in its covering with the nail of His big toe. Through the hole, the pure water of the Causal Ocean entered this universe as the Ganges River. Having washed the lotus feet of the Lord, which are covered with reddish powder, the water of the Ganges acquired a very beautiful pink color. Every living being can immediately purify his mind of material contamination by touching the transcendental water of the Ganges, yet its waters remain ever pure. Because the Ganges directly touches the lotus feet of the Lord before descending within this universe, she is known as Vishnupadi. Later she received other names like Jahnavi and Bhagirathi. After one thousand millenniums, the water of the Ganges descended on Dhruvaloka, the topmost planet in this universe. Therefore all learned sages and scholars proclaim Dhruvaloka to be Vishnupada [“situated on Lord Vishnu’s lotus feet”]. yatra ha vava vira-vrata auttanapadih parama-bhagavato ’smat-kula-devata-caranaravindodakam iti yam anusavanam utkrishyamana-bhagavad-bhakti-yogena dridham klidyamanantar-hridaya autkanthya-vivasamilita-locana-yugala-kudmala-vigalitamala-bashpa-kalayabhivyajyamana-roma-pulaka-kulako ’dhunapi paramadarena sirasa bibharti. Dhruva Maharaja, the famous son of Maharaja Uttanapada, is known as the most exalted devotee of the Supreme Lord because of his firm determination in executing devotional service. Knowing that the sacred Ganges water washes the lotus feet of Lord Vishnu, Dhruva Maharaja, situated on his own planet, to this very day accepts that water on his head with great devotion. Because he constantly thinks of Krishna very devoutly within the core of his heart, he is overcome with ecstatic anxiety. Tears flow from his half-open eyes, and eruptions appear on his entire body. When a person is firmly fixed in devotional service to the Supreme Personality of Godhead, he is described as vira-vrata, fully determined. Such a devotee increases his ecstasy in devotional service more and more. Thus as soon as he remembers Lord Vishnu, his eyes fill with tears. This is a symptom of a maha-bhagavata. Dhruva Maharaja maintained himself in that devotional ecstasy, and Sri Caitanya Mahaprabhu also gave us a practical example of transcendental ecstasy when He lived at Jagannatha Puri. His pastimes there are fully narrated in Caitanya-caritamrita. tatah sapta rishayas tat prabhavabhijna yam nanu tapasa atyantiki siddhir etavati bhagavati sarvatmani vasudeve ’nuparata-bhakti-yoga-labhenaivopekshitanyarthatma-gatayo muktim ivagatam mumukshava iva sabahu-manam adyapi jata-jutair udvahanti. The seven great sages [Marici, Vasishtha, Atri and so on] reside on planets beneath Dhruvaloka. Well aware of the influence of the water of the Ganges, to this day they keep Ganges water on the tufts of hair on their heads. They have concluded that this is the ultimate wealth, the perfection of all austerities, and the best means of prosecuting transcendental life. Having obtained uninterrupted devotional service to the Supreme Personality of Godhead, they neglect all other beneficial processes like religion, economic development, sense gratification and even merging into the Supreme. Just as jnanis think that merging into the existence of the Lord is the highest truth, these seven exalted personalities accept devotional service as the perfection of life. tato ’neka-sahasra-koti-vimananika-sankula-deva-yanenavatar-antindu mandalam avarya brahma-sadane nipatati. After purifying the seven planets near Dhruvaloka [the polestar], the Ganges water is carried through the spaceways of the demigods in billions of celestial airplanes. Then it inundates the moon [Candraloka] and finally reaches Lord Brahma’s abode atop Mount Meru. tatra caturdha bhidyamana caturbhir namabhis catur-disam abhispandanti nada-nadi-patim evabhinivisati sitalakananda cakshur bhadreti. On top of Mount Meru, the Ganges divides into four branches, each of which gushes in a different direction [east, west, north and south]. These branches, known by the names Sita, Alakananda, Cakshu and Bhadra, flow down to the ocean. sita tu brahma-sadanat kesaracaladi-giri-sikharebhyo ’dho ’dhah prasravanti gandhamadana-murdhasu patitvantarena bhadrasva-varsham pracyam disi kshara-samudram abhipravisati. The branch of the Ganges known as the Sita flows through Brahmapuri atop Mount Meru, and from there it runs down to the nearby peaks of the Kesaracala Mountains, which stand almost as high as Mount Meru itself. These mountains are like a bunch of filaments around Mount Meru. From the Kesaracala Mountains, the Ganges falls to the peak of Gandhamadana Mountain and then flows into the land of Bhadrasva-varsha. Finally it reaches the ocean of salt water in the west. evam malyavac-chikharan nishpatanti tato ’nuparata-vega ketumalam abhi cakshuh praticyam disi sarit-patim pravisati. The branch of the Ganges known as Cakshu falls onto the summit of Malyavan Mountain and from there cascades onto the land of Ketumala-varsha. The Ganges flows incessantly through Ketumala-varsha and in this way also reaches the ocean of salt water in the West. bhadra cottarato meru-siraso nipatita giri-sikharad giri-sikharam atihaya sringavatah sringad avasyandamana uttarams tu kurun abhita udicyam disi jaladhim abhipravisati. The branch of the Ganges known as Bhadra flows from the northern side of Mount Meru. Its waters fall onto the peaks of Kumuda Mountain, Mount Nila, Sveta Mountain and Sringavan Mountain in succession. Then it runs down into the province of Kuru and, after crossing through that land, flows into the saltwater ocean in the north. tathaivalakananda dakshinena brahma-sadanad bahuni giri-kutany atikramya hemakutad dhaimakutany ati-rabhasatara-ramhasa luthayanti bharatam abhivarsham dakshinasyam disi jaladhim abhipravisati yasyam snanartham cagacchatah pumsah pade pade ’svamedha-rajasuyadinam phalam na durlabham iti. Similarly, the branch of the Ganges known as Alakananda flows from the southern side of Brahmapuri [Brahma-sadana]. Passing over the tops of mountains in various lands, it falls down with fierce force upon the peaks of the mountains Hemakuta and Himakuta. After inundating the tops of those mountains, the Ganges falls down onto the tract of land known as Bharata-varsha, which she also inundates. Then the Ganges flows into the ocean of salt water in the south. Persons who come to bathe in this river are fortunate. It is not very difficult for them to achieve with every step the results of performing great sacrifices like the Rajasuya and Asvamedha yajnas. The place where the Ganges flows into the salt water of the Bay of Bengal is still known as Ganga-sagara, or the meeting place of the Ganges and the Bay of Bengal. On Makara-sankranti, in the month of January–February, thousands of people still go there to bathe, hoping to be liberated. That they can actually be liberated in this way is confirmed herein. For those who bathe in the Ganges at any time, the results of great sacrifices like the Asvamedha and Rajasuya yajnas are not at all difficult to achieve. Most people in India are still inclined to bathe in the Ganges, and there are many places where they can do so. At Prayaga (Allahabad), many thousands of people gather during the month of January to bathe in the confluence of the Ganges and Yamuna. Afterward, many of them go to the confluence of the Bay of Bengal and the Ganges to take bath there. Thus it is a special facility for all the people of India that they can bathe in the water of the Ganges at so many places of pilgrimage. anye ca nada nadyas ca varshe varshe santi bahuso merv-adi-giri-duhitarah satasah. tatrapi bharatam eva varsham karma-kshetram anyany ashta varshani svarginam punya-seshopabhoga-sthanani bhaumani svarga-padani vyapadisanti. Among the nine varshas, the tract of land known as Bharata-varsha is understood to be the field of fruitive activities. Learned scholars and saintly persons declare the other eight varshas to be meant for very highly elevated pious persons. After returning from the heavenly planets, they enjoy the remaining results of their pious activities in these eight earthly varshas. “One should render transcendental loving service to the Supreme Lord Krishna favorably and without desire for material profit or gain through fruitive activities or philosophical speculation. That is called pure devotional service.” Those who fully engage in devotional service to Krishna just to please Him are not interested in the three divisions of heavenly places, namely, divya-svarga, bhauma-svarga and bila-svarga.